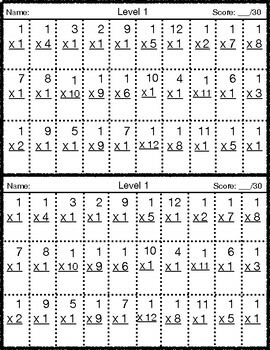 This packet was designed to help the student I tutor who is having difficulties mastering his multiplication facts. 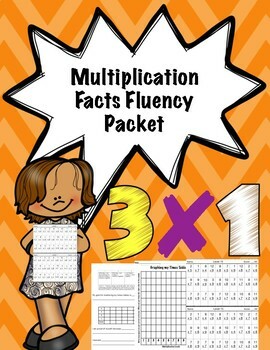 I added pages in it so you can use it in the classroom with your own students to monitor their growth with Multiplication Fact Fluency. Students are given a set time (you can choose from 1-3 min) to complete the 30 facts for that level. Tests start with the 1’s times table facts. Each level focuses on each fact until all facts to 12 are mastered. I also included levels for mixed facts. See levels below for what is included in each one. 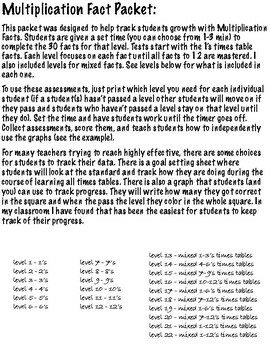 To use these assessments, just print which level you need for each individual student (if a student(s) hasn’t passed a level other students will move on if they pass and students who haven’t passed a level stay on that level until they do). Set the time and have students work until the timer goes off. Collect assessments, score them, and teach students how to independently use the graphs (see the example). For many teachers trying to reach highly effective, there are some choices for students to track their data. 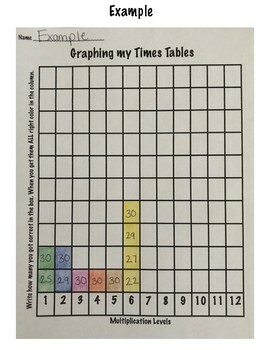 There is a goal setting sheet where students will look at the standard and track how they are doing during the course of learning all times tables. There is also a graph that students (and you) can use to track progress. They will write how many they got correct in the square and when the pass the level they color in the whole square. In my classroom I have found that has been the easiest for students to keep track of their progress.